Sometimes, you just want a little cocktail, but only have a few things in the fridge or pantry. This is perfect drink for those times. We seem to almost always have a lime or a knob of ginger lying around as I’m always making Asian noodles of one sort or another. 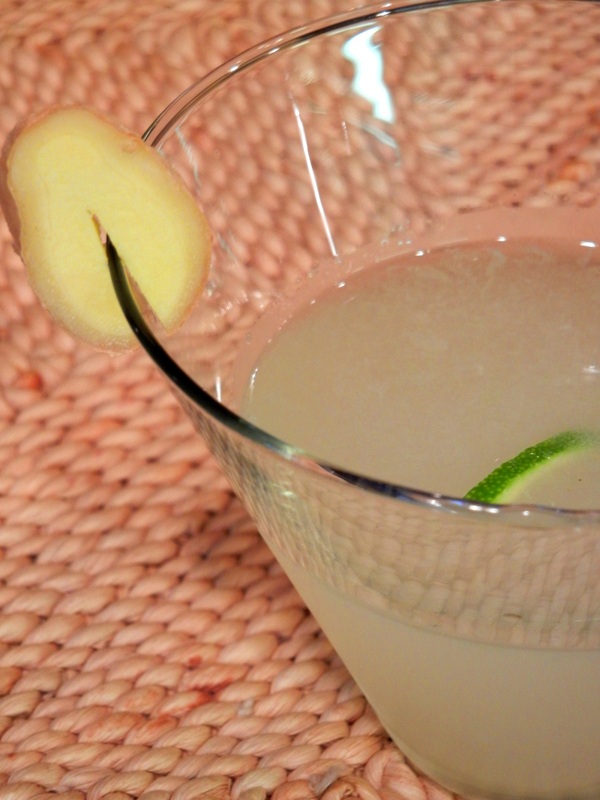 Tried and true, this is a gimlet with just a little twist. It’s extra delicious with OYO Vodka. But then again, just about everything is better with a little OYO Vodka. In a nonstick pan, take a thumb-sized piece of ginger, peeled and diced, and throw it in with a tablespoon of sugar and a tablespoon of water. Heat it until it becomes extremely syrupy, and add it to your simple syrup (1/2 c sugar, 1/2 water, brought to a boil, simmered for a moment or two and allowed to cool). Let it infuse for as long as you like, but try to give it at least 15 minutes. Strain. In a shaker with crushed ice, combine all ingredients, shake well, and strain into a martini glass. Garnish with ginger and lime. Playlist included Surfboard, by Esquivel.